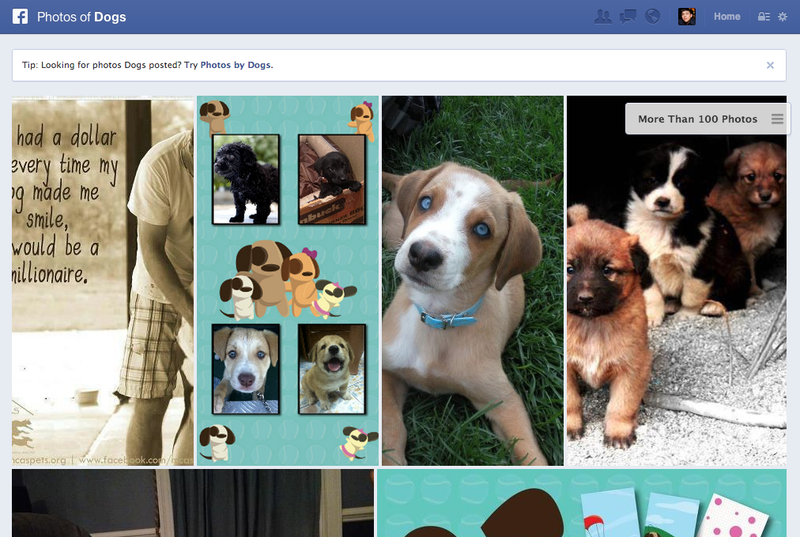 Today, Facebook announced the launch of Graph Search to help users find useful information via the social graph. For now, Graph Search is only available to a small segment of users, but moments ago, we were granted access. Here is our hands-on take on it. Started by two former Google employees, Lars Rasmussen and Tom Stocky, Graph Search is a useful tool that lets users query anything that they want ranging from people, photos, and things. Those that want to check it out will need to sign up for the wait list using (what else?) Facebook. It’s important to note that Graph Search is only available right now to those using the social network on the desktop. Mobile and tablet devices will not be able to use it. At first glance, users will realize that the top navigation bar has been redesigned in a way that Facebook’s standard logo has been changed on the top left-hand side of the site. In its place rests its “f” logo and a search bar. As part of the on-boarding process, the social network encourages you to participate in a tour to learn more about the service. If you choose to ignore the tutorial, you can start by simply typing in a search query like you normally would on Google, Bing, or Yahoo. As users type a query in, they will begin to notice results beginning to appear below the text field. To help get things started, Facebook offers users some sample searches, including photos of your friends, restaurants nearby, games your friends play, music your friends like, and photos that you like. As a query begins to be typed, Graph Search begins using its algorithm to determine what results it should be displayed. The more detailed the query, the more complex the search. 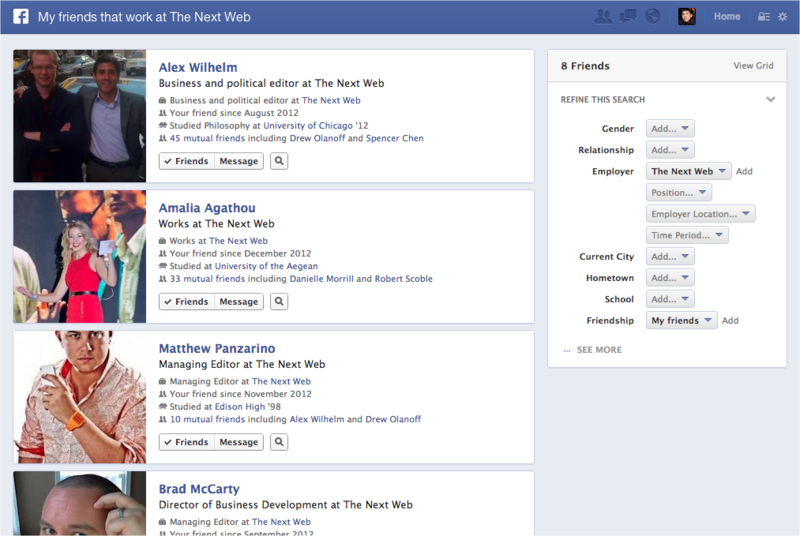 By that we mean if you query “The Next Web”, it will know to display relevant Pages, Groups, and even friends. But, if you type in a more complex search like “Friends that work at The Next Web”, you get a much different result. After searching, users can refine their search based on dozens of categories, including gender, relationship, employer, current city, hometown, school, and friendship. All results are organized based on relevance and interest to the user. 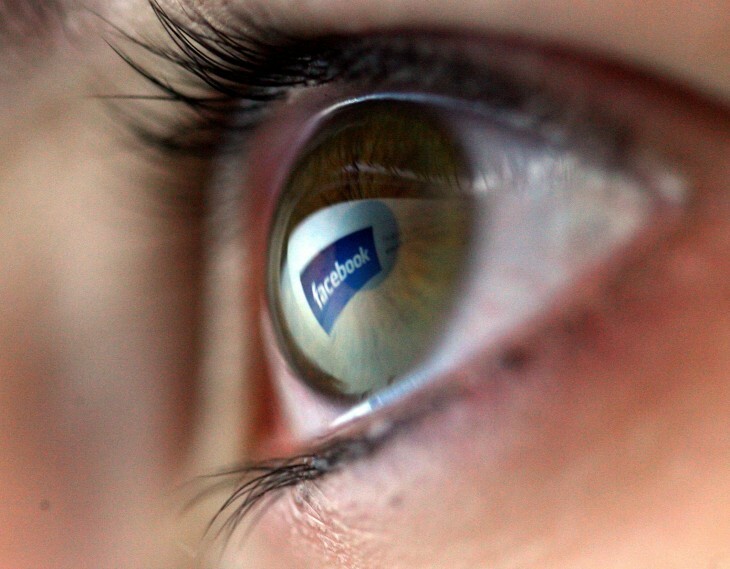 While Facebook says that only content shared with you are visible, any other similarities like interests, education, and other traits will display people that you might find interesting — the social network tells us that the Graph Search should help in aiding discovery of new connections. Whether it’s photos, people, videos, or anything else, results that have the most friend connections to will bubble up to the top of the search results. Unlike searches on Google, Yahoo, or Bing, results displayed in Graph Search don’t have paginated results — all are displayed within one screen (but may require a lot of scrolling. In the event that the search results from Facebook aren’t enough for you, there is an option to execute the query in Bing within the social network’s UI. With respect to privacy, Zuckerberg mentioned today that the social network was going to add a banner to the top of users’ News Feed to inform them of the new privacy controls that it implemented recently. At this time, we did not see it on the site, but gather that it will be added shortly. Overall, Facebook’s Graph Search is a pretty interesting service to help users better connect with one another. Unfortunately at this point, it doesn’t pull in results from specific posts, just photos, videos, and interests.